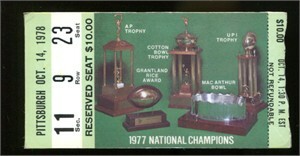 Original ticket stub from the Oct. 14 1978 Notre Dame Fighting Irish vs. Pittsburgh Panthers college football game won by the Irish 26-17 in dramatic fashion as Joe Montana threw 2 TD passes and ran for another TD to erase a 17-7 fourth quarter deficit to hand the 9th ranked Panthers their first loss of the season. In this game, Irish running back Jerome Heavens also broke George Gipp's career rushing record which had stood for more than 50 years. 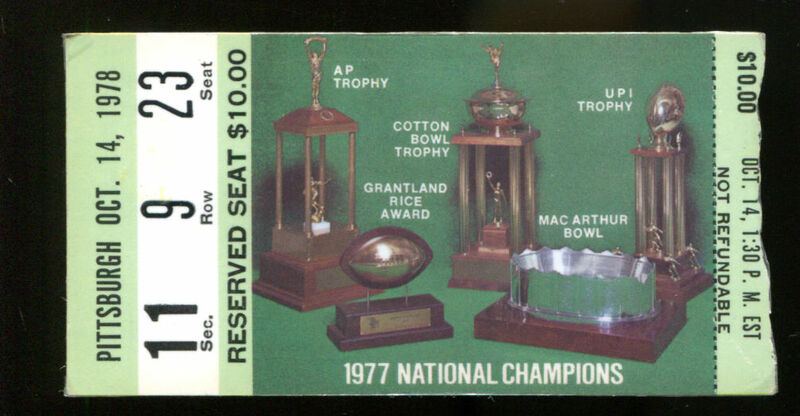 Ticket stub is laminated and has minor flaws and wear. ONLY ONE AVAILABLE FOR SALE.